Two new Windows Phone 8 offerings will be making their way stateside on Sprint's 4G LTE network this summer. 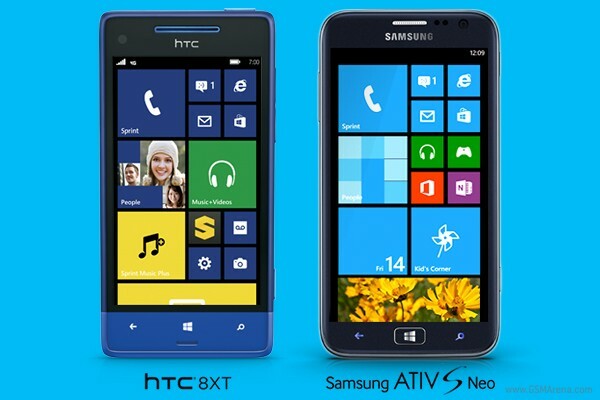 The first is the HTC 8XT, toting a 4.3-inch display of WVGA resolution as well as a Snapdragon 400 chipset with a 1.4 GHz dual-core Krait CPU. The RAM is 1GB, while internal memory is only 8 GB but can be expanded by up to 64GB thanks to the microSD card slot. The HTC 8XT will draw its juice from a 1800 mAh battery. Samsung's ATIV S Neo, like the regular ATIV S, will offer a larger 4.8-inch display of 720p resolution (we're not sure if it'll be of the AMOLED variety, however), a dual-core 1.4 GHz processor, 1 GB of RAM and a 2000 mAh battery. There's also mention of the ATIV S's NFC connectivity and 1.9 MP front-facing camera. Sprint is keeping mum on a more specific release date, saying only "this summer," but on contract pricing has been listed at $99 for the HTC 8XT (after $50 rebate), and $149 for the Samsung ATIV S Neo (after $50 rebate).